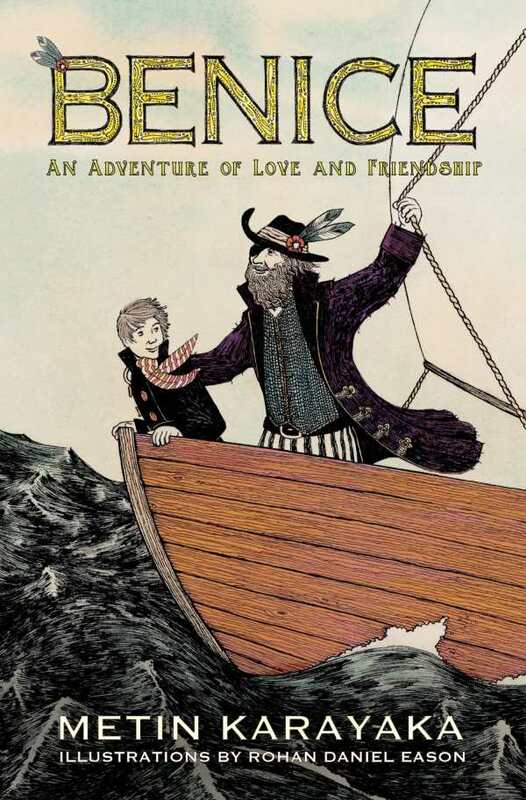 Benice is an often enchanting work that harks back to seafaring adventures of days past. Metin Karayaka’s classically appealing middle grade adventure Benice is set in a fictional version of Yalova, a Turkish port city on the Marmara Sea. In it, a seafaring trip culminates in lessons on love and friendship. The narration pulls readers into a multilayered world. When Levend—now an adult—returns to Yalova on the eve of a party, he meets children carrying the catch of the day, as Levend himself once did. The encounter inspires Levend to remember his time with Mr. Ben Ice, whom the children regard as a legend but whom Levend considers a friend. Mr. Ben Ice taught him the secrets of the sea. A measured and imaginative tale incorporates elements ranging from magical sea bubbles and lobster-popster creatures to piracy, a treasure hunt, and a journey to Zanzibar in search of a potent elixir. Also prominent is Barbarossa, here only loosely inspired by the fourteenth-century Ottoman admiral; in this story, he turns from sincerity and honesty to grief and treachery. The story darts between the past and present, with interludes told from different perspectives that fill in the gaps. The dynamic between Levend and Ben Ice is magnetic. Their relationship illustrates betrayal and forgiveness. Ben Ice’s true identity adds to the sense that Levend has found an unusual man. Despite occasional darkness, including a moment of revenge, his character has a faithful heart and is motivated by love. That Ben Ice’s message to those surrounding him seems benign, even idealistic, doesn’t detract from its simple truth. Still, this book is a throwback story. Little Fan Fan and Giant Yang Yang, a pair of Asian twins, have alliterative names and pencil-thin, villainous mustaches in their character designs, though they function as faithful companions. Convenient developments and sudden changes of heart (as when a pirate, Zamora, opts not to kill children solely because one of them speaks up) impede the text’s progression. The book’s illustrations are a highlight. Rohan Daniel Eason is a fine artist; his work is as intricate as linocuts and is filled with strong lines and thoughtful compositions. A variety of scenes on shore, underwater, aboard the pirates’ ship, and elsewhere are a vibrant amalgam of realism and fantasy.